CANADIAN businessman Sir Henry Pellatt firmly believed in every man's home being his castle, so when he and Lady Mary decided in 1912 on somewhere new to live, they had plans drawn up for just that – a castle. He was not the least phased when his architect said he would first need 25 hilltop housing lots overlooking Toronto to accommodate it, nor that it would take 300 men three years to put his castle together. And as for the cost, that was no problem either: Sir Henry had a loose C$3,500,000 (about $48m in today's terms) he'd put aside just for his house. Sorry, castle. Today, as a result of Sir Henry falling on hard times just ten years after moving into his castle, inquisitive visitors can take themselves on a nostalgic tour of the Pellatt's remarkable fairytale home. They can marvel at its 98 Edwardian-era rooms that took 40 staff and cooks to maintain and service, a banquet hall with 18m high ceilings, a kitchen with an oven large enough to cook a whole ox, secret passageways, artworks, a library that once housed 10,000 volumes, three bowling alleys (that were never completed,) and a wine cellar that held more bottles than most of us could contemplate getting through in a lifetime. Henry Pellatt was born into a wealthy Canadian stock-broking family in 1859, and as a young man made a fortune from the family company and his own investments in everything from railways to insurance companies and founding the Toronto Electric Light Company. While he chaired the boards of 21 companies, he was also very active in the volunteer Canadian Queen's Own Rifles, while Lady Mary worked tirelessly with the Canadian Girl Guides, receiving their highest honour, the Silver Fish. Henry Pellatt was awarded a knighthood for his services both to the Queen's Own Rifles and for bringing electricity to Toronto from Niagara Falls. The Pellatts moved into their castle in 1914 and named it Casa Loma, Spanish for The House on the Hill. Because one of his investments was the Roman Stone Company, the castle was built of replica ancient roman building blocks the company cast from concrete, with foundations sunk 15m into the ground to support it. A keen horseman, Sir Henry's stables had each horse's name displayed in gold leaf on their stall's mahogany doors. And in case it rained, a 250m-long tunnel ran 6-metres under an outside roadway to link castle and stables. Although designed externally along medieval lines, Casa Loma had some amazing mod-cons for its time, including showers with nozzles spraying from the top and three walls as well, and one of Canada's first private elevators. 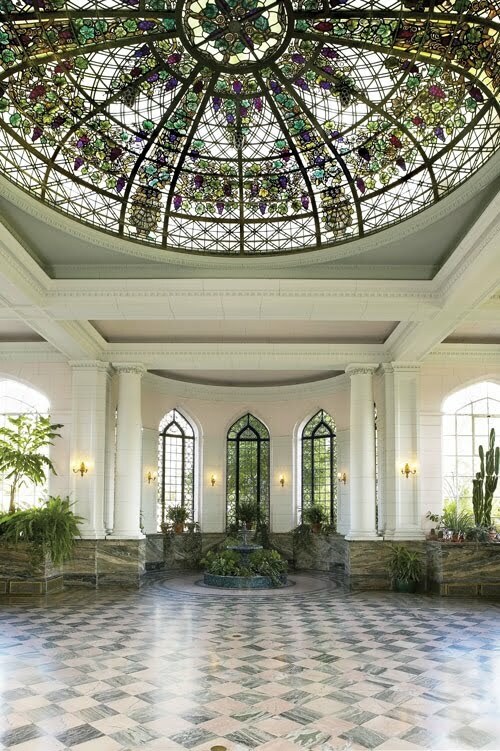 And being keen gardeners the Pellatts had a conservatory and potting house with floors and walls of Italian and Canadian marble, topping it with a stained-glass dome that was backlit with 600 new-fangled electric light bulbs to show it off by night and day – and promote the product of his Toronto Electric Light Company. To communicate through the castle's jigsaw of rooms and the outside world, a private 59-line telephone exchange handled more calls in its first few years than the entire City of Toronto. 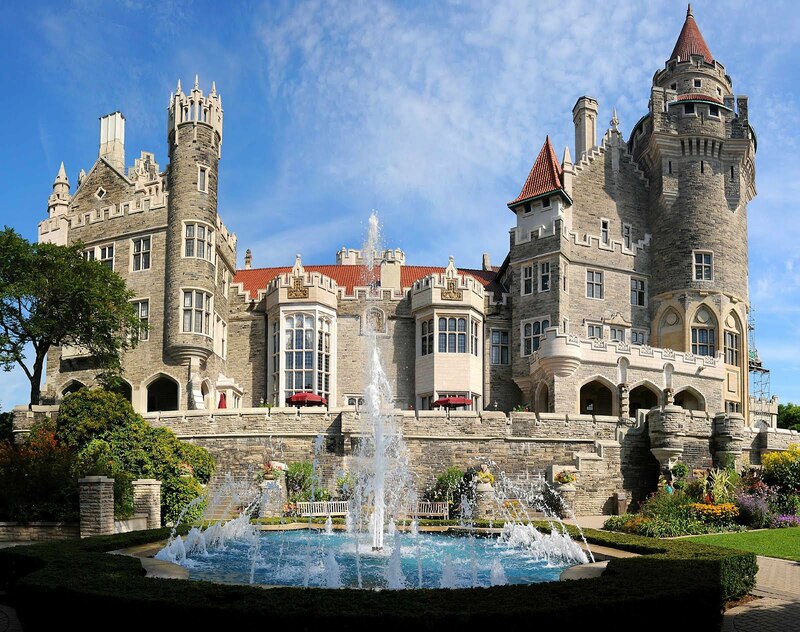 But World War I hit Sir Henry hard, his stock crashed, companies folded and he and Lady Mary were forced to auction off C$1.5m in art and furnishings for a mere C$250,000, abandoning Casa Loma in 1923 for their small farm outside town; Lady Mary died that same year and Sir Henry in 1939. For a while the castle operated as a luxury hotel and became a popular nightspot. 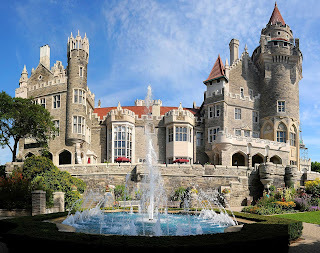 The City of Toronto seized it for unpaid taxes in 1933 and leased it to the Kiwanis Club of Toronto (later the Kiwanis Club Casa Loma,) which used it to raise funds for the castle's maintenance and charitable projects until management was taken over again in 2011 by the City Council. 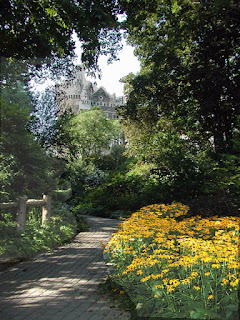 PHOTO CAPTIONS: (CANADA TORONTO CASA LOMA…. EVERY man's home is his castle: the extraordinary castle-home of Sir Henry and Lady Mary Pellatt. 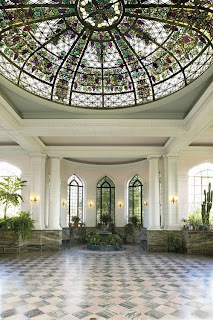 JUST the place for potting up the plants: Casa Loma's Conservatory whose stained-glass dome was back-lit with 600 electric light globes. 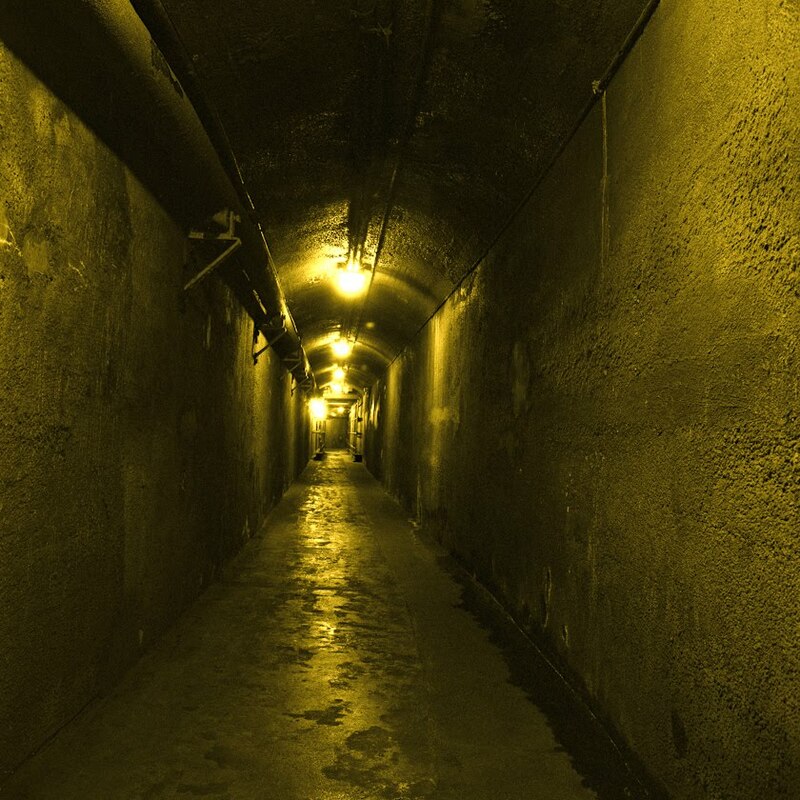 TUNNEL vision: Sir Henry had several "secret" tunnels for emergency escape routes, plus this one under the outside road to his stables. 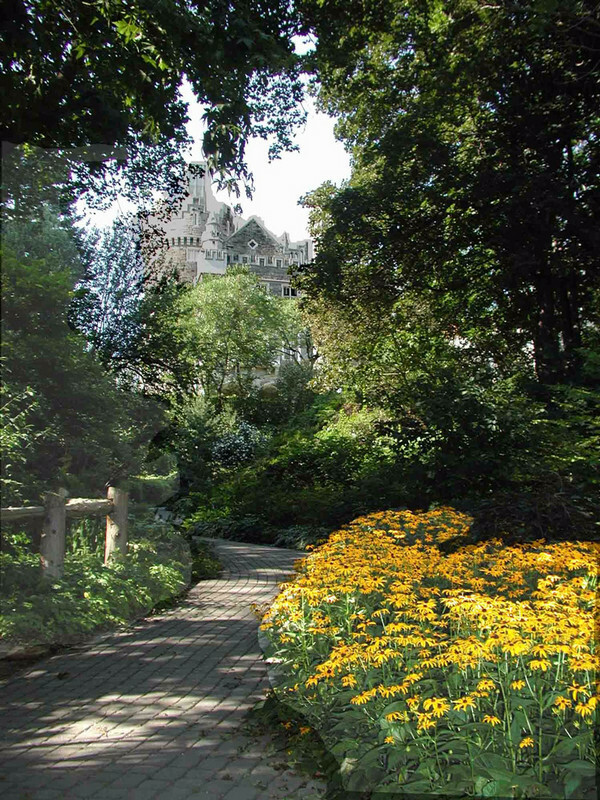 PART of the 2ha of landscaped gardens surrounding Casa Loma Castle.